Peach Coconut Ice Cream is a dessert that serves 14. Watching your figure? This gluten free and lacto ovo vegetarian recipe has 188 calories, 2g of protein, and 14g of fat per serving. For 72 cents per serving, this recipe covers 5% of your daily requirements of vitamins and minerals. A mixture of full-fat coconut milk, half & half, cane sugar, and a handful of other ingredients are all it takes to make this recipe so yummy. Summer will be even more special with this recipe. 8 people found this recipe to be flavorful and satisfying. From preparation to the plate, this recipe takes roughly roughly 45 minutes. It is brought to you by Foodista. With a spoonacular score of 26%, this dish is rather bad. Similar recipes include Coconut-Peach Cobbler with Bourbon-Pecan Ice Cream, Coconut Peach Ice Cream With Toasted Almonds Best Lick! 2008, and Roasted Strawberry Coconut Milk Ice Cream (Vegan) + Tips for Making Your Homemade Ice Cream Soft. Ice Cream works really well with Cream Sherry, Moscato d'Asti, and Port. A common wine pairing rule is to make sure your wine is sweeter than your food. Delicate desserts go well with Moscato d'Asti, nutty desserts with cream sherry, and caramel or chocolate desserts pair well with port. The NV Solera Cream Sherry with a 4.5 out of 5 star rating seems like a good match. It costs about 17 dollars per bottle. The Solera Cream Sherry has a brilliant amber and deep copper hue. With butterscotch and pecan aromas, the sweet salted nut and brown spice aromas carry a complex caramel accent. A sweet entry leads to a rounded, lush, moderately full-bodied palate with a lengthy, flavorful finish. Heat coconut milk and half & half on the stove over medium high in a saucepan until hot and barely bubbling (bring to a low boil). Add sugar; mix to dissolve. Remove from heat. Pour mixture into a blender along with the chopped peaches. Allow mixture to cool about 10 minutes before pouring mixture in a large container; refrigerate a few hours until cold. If using an ice cream maker, follow the instructions on your ice cream maker accordingly. 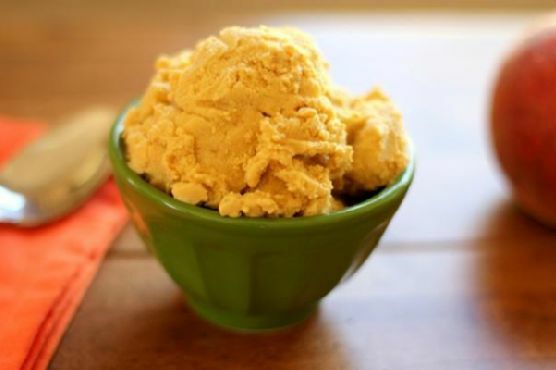 You can also try this without an ice cream maker by putting the ice cream mixture in a freezer-safe container, placing it in the freezer and stirring with a spoon every hour for roughly 8 10 hours. If you try this without an ice cream maker the consistency will not be as creamy as youd get when using an ice cream maker, but the ice cream will still be great! If you have leftovers in the freezer, thaw the ice cream at least 10 minutes before attempting to dig in because it will be much stiffer than store-bought ice cream. Frozen (and potentially even canned) fruit and vegetables contain as much?if not more?vitamins than fresh versions that have been sitting around the supermarket too long. So don't hesitate to buy canned or frozen goods if your budget or the season doesn't allow for fresh! When buying canned fruit, buy fruit packed in fruit juice and check the label to avoid added sugar. The fruit is sweet enough, it doesn't need any help! Confused by the different types of cream — Most differences arise from the fat content of the cream, and whether or not the cream has been "soured" by adding lactic acid bacteria to give it a tangy flavor.